Candidates who are searching for the MP High Court Recruitment those can take a look on this page. Here in this article, we had given the important details about the Madhya Pradesh High Court Advertisement 2018. Candidates who are interested in this mphc.gov.in Jobs 2018, they can apply from 13th November 2018 to 14th December 2018. Before applying, competitors need to read the entire notification of MPHC Openings 2018 for Assistant (Sahayak) Grade III details such as educational qualification, selection process, salary, post-wise vacancies, set of instructions to apply, and others. We had arranged the direct PDF link of MP High Court Recruitment 2018 Notification at the end of this page. candidates can bookmark our site that is Sarkari Naukri for more fresh updates by clicking the Ctrl+D. The applicants who are going to apply for the MP High Court Recruitment 2018, they must have the minimum educational qualification as per official MP High Court Recruitment 2018 Notification. Visit the official page of the Madhya Pradesh High Court i.e, mphc.gov.in to get more information about the educational qualifications. Candidates must complete Graduation from recognized University. Hindi and English typing test pass or scorecard of CPCT Exam pass by MAP-IT. One Year diploma course in computer application. Aspirants must have the given Age Limit For MP High Court Openings 2018 as mentioned below to apply for the MP High Court Recruitment 2018. Candidates who had applied for the MP High Court Recruitment 2018, they will be selected based on the selection process which was conducted by the higher authorities of the Madhya Pradesh High Court. Candidates who got selected by clearing all the selection rounds, then they will get the pay scale as per the rules and regulations of the Madhya Pradesh High Court. Applicants need to keep in touch with us we will update this page whenever officials release the recruitment notification. Applicants those who want to participate in this Selection process they need to pay the application fee. So we suggest the candidates, to refer the below section or can also visit the official site of MP High Court Recruitment 2018 Notification to know the application details and which is attached in the below section of this page. First of all, competitors have to check the official site of Madhya Pradesh High Court that is mphc.gov.in. In that go to the Recruitment/ Result section which is top left of the home page. Search for the black flashing link of MP High Court Recruitment 2018. 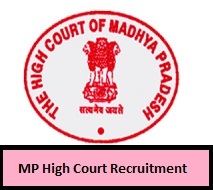 Download the MP High Court Recruitment 2018 Notification. Read the complete details in the MP High Court Recruitment 2018 Notification. After completion of reading, if you are eligible then apply for the MP High Court Recruitment 2018. Take two or more copies of MP High Court Recruitment 2018 Application Form for further usage.